The Parker domnick hunter H high purity hydrogen gas generators offer the optimum combination of safe operation, reliability and performance. Utilising field proven PEM call technology, hydrogen is produced on demand from deionised water and electricity, at a low pressure and with minimal stored volume. Innovative control software allows unrivalled operational safety and reliability. 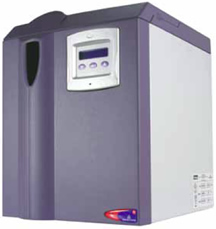 The H Generators ideally supply fuel gas to all known GC combustion detectors used in today’s laboratory workflows. Three models operate at flow rates; 160 ml/min, 250 ml/min and 500 ml/min. A range of tailored service contracts, extended warranties and global manufacturing capabilities provide comprehensive aftermarket support. 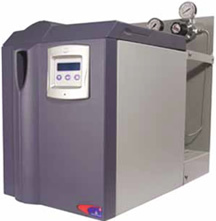 The Parker domnick hunter 40H-ICP hydrogen gas generator, developed in callaboration with Varian Instruments, meets the initial purge and reaction gas requirements of the Collision Reaction Interface, providing simple routine removal of troublesome spectroscopic indifferences. Utilising field proven PEM cell technology, hydrogen is produced on demand from deionised water and electricity, at low pressure and with minimal stored volume. Innovative control software allows unrivalled operational safety and reliability. The 40H-ICP hydrogen generator employs a fully approved low-pressure buffer arrangement, to cater for elevated hydrogen flows required during the purge cycle of Varian ICP-MS Instrumentation.